Driveways 4 You is a Paving Contractor Dublin and Kildare that provides paving, tarmac driveways contractor and groundwork services in Dublin and Kildare. Driveways 4 You is a third generation family business of paving contractors dublin founded in 1972. Since then we have grown from strength to strength. We take great pride in landscape design and garden design and aim to create an, attractive, practical and innovative outdoor space that is suited to your site, lifestyle and budget. We complete our work is based on a thorough understanding of the industry. From the design brief Driveways 4 You will creatively develop a concept plan suited to your site, lifestyle and personal preferences. Plans include a detailed layout of landscape lighting that is essential to highlighting the design in the evening. Synthetic grass and turf services is also available. A lot of time block paving would be integrated into most landscaping projects. At Driveways 4 You we offer a wide variety of paving materials and designs. Once a site visit has been completed, Driveways 4 You will develop an award winning design that will suit you, your property, lifestyle and budget. Whether this is a small back garden or driveway, extension or larger project we offer customers a full design and landscaping service. Why not add value to your property and change its appearance with a new Tarmacadam driveway. Driveways 4 You provides a hot Tarmacadam service. At Driveways 4 You we can hand lay those smaller jobs in housing estates or machine lay bigger jobs like car parks, tennis courts or avenues. We offer a full service from initial consultation, site prep, Kerbing and drainage. At Driveways 4 You we also offer a complete tar and chipping service for those long lanes or old country homes. This comes in a variety of different colours. We have been in the building industry for the last 20 years and also provide a full roofing service. Paving Contractors Dublin – We are a leading Dublin paving contractors Dublin and surrounding areas. We take pride in offering you a high quality paving solution at an affordable price for your Residential, Commercial and Industrial property. Driveways 4 You have been completing projects for Commercial sites and Residential homes for over 40 years. We offer services that are second to none at Lowest Prices Guaranteed. Call for a free consultation and estimate today. 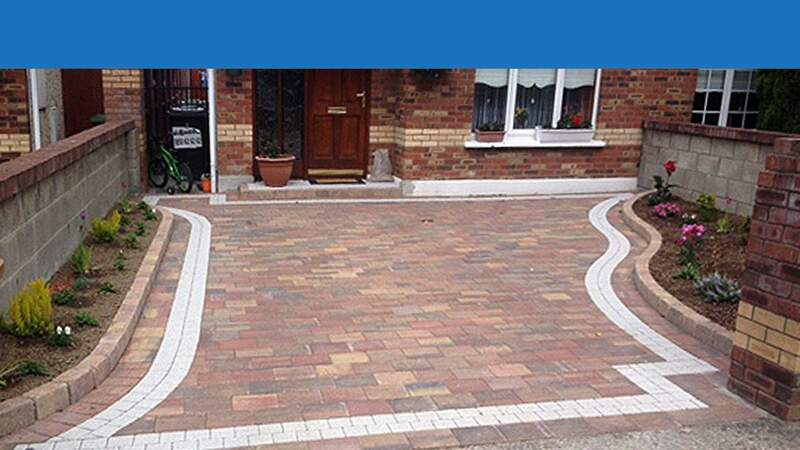 Tarmac is still one of the most popular finishes for driveways in Dublin today due to its longevity, flexibility and cost savings. It can be very attractive with our extensive array of decorative edgings. Dublin tarmac contractors. Paving made to last, we pave driveways in numerous styles, colours and sizes to complement all settings. Dublin paving contractors. We can create your beautiful patio with a large range of paving slabs and decorative features such as circles, granite sets, walling, edging and stepping stones. Patio contractors Dublin. For an impressive hard-wearing and natural finish, tar and chipping driveways are a popular alternative to tarmac or paving in Dublin. Chippings come is various sizes and colours. Tar and chipping contractors Dublin. Gravel driveways are another option to enhance your driveway. We stock a large collection of gravel for driveways to match all styles of homes. Gravel Driveways Dublin. Pattern Imprinted Concrete specialists, our aim and focus is to constantly improve our levels of quality workmanship and good customer service, in order to maintain our outstanding reputation. Printed concrete Dublin.